A letter of thanks from Miss Martha Berry for the warm clothes sent to her from Mrs. Heath to clothe the young children of Rome who are in desperate need of warm clothing for the winter months. 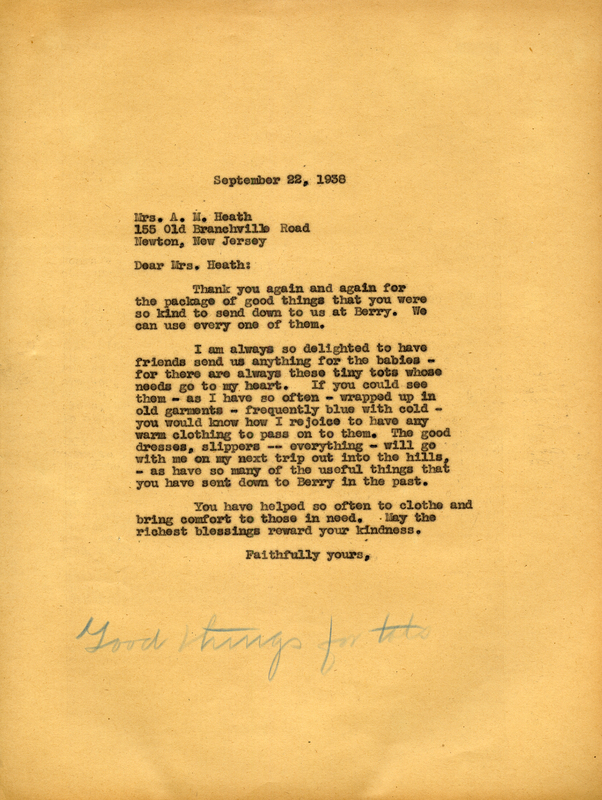 Miss Martha Berry, “Letter to Mrs. A. M. Heath from Miss Martha Berry.” Martha Berry Digital Archive. Eds. Schlitz, Stephanie A., Jessica Hornbuckle, Camille Hanner, et al. Mount Berry: Berry College, 2016. accessed April 20, 2019, https://mbda.berry.edu/items/show/14465.